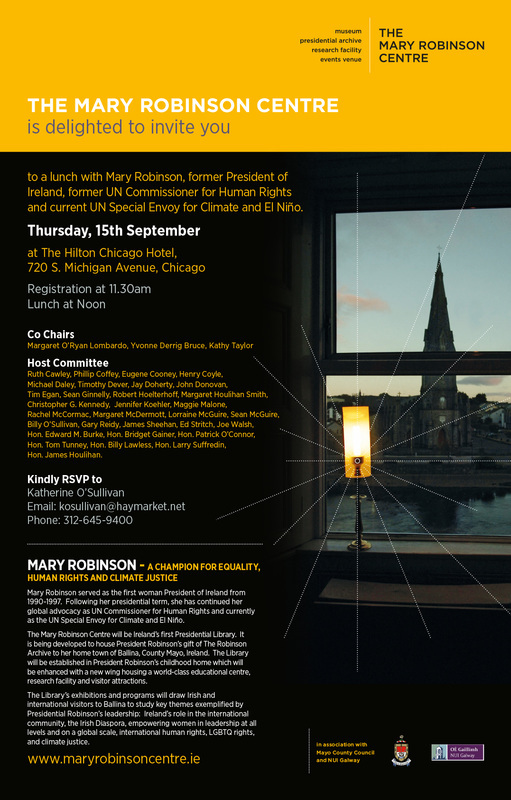 Mary Robinson has a stellar international reputation and the prospect of developing the Mary Robinson Centre in collaboration with NUI Galway and Mayo County Council has captured the imagination of the Irish American community in Chicago. The Irish Fellowship of Chicago, the American Ireland Funds, the Mayo Association and the Irish American Heritage Centre are among the organisations planning a fundraising lunch in the Hilton Chicago on September 15th. The former President and UN Human Rights Commissioner, and current UN Special Envoy for El Niño and Climate will speak at the lunch, outlining plans for the Centre and its importance for Ballina and for the West of Ireland, in particular its vital role in attracting students, researchers and the wider public from around the world to the Ballina Centre. ​All of Irish America in Chicago are invited to attend. For tickets, sponsorship opportunities or to book your place, please contact Katherine O'Sullivan by email or phone 312-645-9400.